Noah Currier was, and will always be, a proud United States Marine. 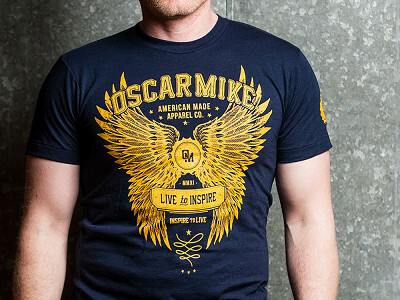 Today, he serves the country and his military brethren with his Made in America apparel company, Oscar Mike. Owned and operated by Noah and three other veterans, the team was inspired when they realized that much of the clothing that honors our military is made overseas. Oscar Mike designs, manufactures, packages and ships exclusively in the U.S.A, and whenever possible, hires fellow vets. These ultra soft T-Shirts feature original designs that graphically celebrate American made products. Wear with pride and feel good about supporting the economy and our brave vets. The term “Oscar Mike” comes from military radio jargon used on the front lines. It translates to “On the Move." 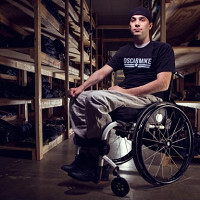 To us, being Oscar Mike means being active, staying positive and living life to its absolute fullest. We are a group of Veterans, athletes, artists and individuals from all walks of life who want to embody the spirit of hard work on which America was founded. We’re striving to bring back a tough, can-do spirit to our great country and we believe that it's still possible to change the American manufacturing industry for the better, one T-Shirt at a time. Your product looks terrific! So excited to see that The Grommet found you and have launched your "Made In America" T-Shirts. I am definitely loving your red ladies tee. We follow you and are also a company that makes our product in the USA. Can't wait to get your product and spread the word. Amy from The Grommet team here. So glad to see your support for today's Grommet. I love these shirts and think they look great on both men and women. Do you make any other designs? I make and sell tees that I design myself and am always looking for Made In The USA things and to support a small business. The designs listed here are what we are offering on our site, but if you'd like to contact our customer support team, they may be able to help offer more suggestions. Am curious how your women's sizing runs. Could you give me a comparison between a large and a women's size 16 or 18? Have you seen our size chart? It's located in the details portion when you click into the box that says "buy". That should give you a pretty good idea. It actually shows you differences in inches that should help. I am totally on board with Made in America as well a a veteran owned company. Definitely need to offer MUCH larger sizes. Would buy in a heartbeat but there are lots of more than XL Americans. Hope you will consider expanding size selection in the future. We offer an xl for women along with a handy size chart when you click into the details portion that is located in the box that says "buy". If the woman's xl is still too small, then I would suggest that you take a look at the men's sizes. They are unisex designs and might work better. Hoping this helps and thanks for supporting these made in America shirts with us. We're very excited for them. Great product and designs. Always happy to purchase Made in America products and to support veterans. Wishing you much success with your company. Noah Currier was, and will always be, a proud United States Marine. 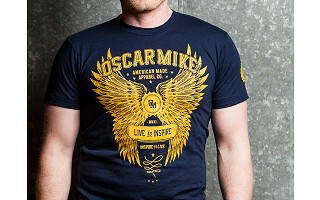 Today, he serves the country and his military brethren with his Made in America apparel company, Oscar Mike. Owned and operated by Noah and three other veterans, the team was inspired when they realized that much of the clothing that honors our military is made overseas. Oscar Mike designs, manufactures, packages and ships exclusively in the U.S.A, and whenever possible, hires fellow vets.